I was two years out from a life altering back injury, overweight, and in pain. I had been an active equestrian for almost all of my life and I had been forced to sell my horses because I could not ride or take care of them anymore. 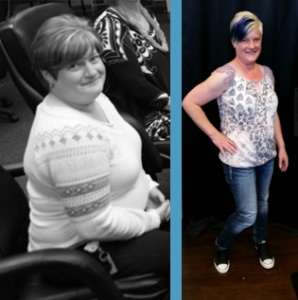 I had belonged to a local health club for one year and also had used a personal trainer, but I just wasn’t seeing the results that I needed. It was time to make a change. I found ABSolute-U Fitness online, called and came in for my free session. I thought I was in shape. After 30 minutes with Brian I found out I was wrong! I believe that all the people that you meet in your life are there at the time that you need them. I was ready to meet Brian. He started me on a path that lead to a 35 pound weight loss and an increase in my strength. That along with a medical procedure and a chiropractor that he recommended, resulted in a complete physical turnaround. I am no longer in pain. My strength has increased beyond what I could ever do. I am riding again and almost ready to be a horse owner.